1:15 PM UPDATE: Both northbound and southbound lanes of I-95 have re-opened. The total burnout of the property is 80% complete, according to Brevard County Emergency Management. 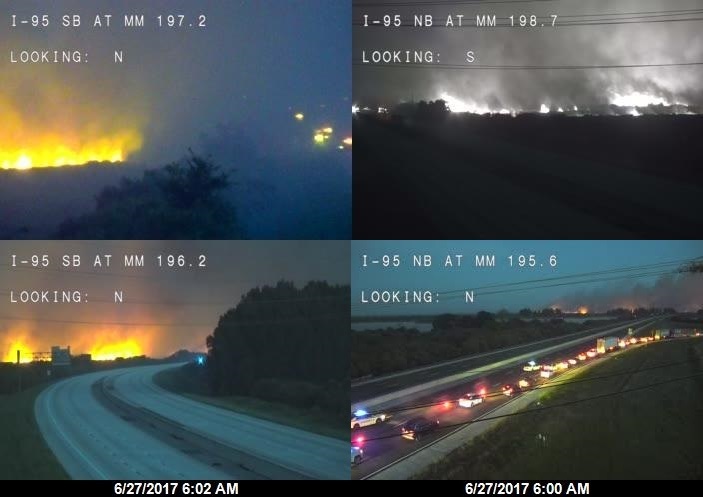 BREVARD COUNTY, Florida - A brush fire burning in West Cocoa, Florida caused the Florida Highway Patrol to shut down all lanes of Interstate 95 from Fiske Boulevard to State Road 520 early Tuesday morning. At 6 a.m., FHP reopened the northbound lanes of I-95 but the southbound lanes remain closed as of 6:15 a.m. Heavy traffic congestion exists along the detour routes in Cocoa, Rockledge, and Viera. Motorists have primarily re-routed to Fiske Boulevard, Murrell Road, and U.S. 1 in order to travel northbound and southbound in central Brevard County. According to Brevard County Fire Rescue, the Tucker Road brush fire has pushed within 150 ft of Interstate 95 due to a wind shift.